A friend of mine recently suggested we reach out to our community a little more. So I have opened an AIM (AOL Instant Messenger) account for those who would like to discuss anything with the Admins at theiLife.com. Feel free to hit us up, anytime, with anything you would like to discuss- or just to leave us a comment or suggestion. As always, you can still leave a comment on the site or email us too! Instant Message away at “theilife” (no quotes, though). This is a continuation of Macworld Keynote Part I and, Macworld Registration Part I and Part II. Sidney woke me up at about 6 o’clock, explaining that they were preparing to let us in. The line was jumping with excitement. The once empty Super and Platinum pass line was now full of people, to the end of the Moscone Center, down 4th Street! The media were finally beginning to fill there designated spot and the “General Users” line wrapped around Howard to 5th Street. By 6:30AM, everyone was standing in line formation- preparing to enter the Moscone West. At approximately 7AM our line leader let us inside, guided by two Apple employees, and we lined up around the second floor. Everyone sat down and used the bathrooms durring the hour we had to wait for the VIP’s to slowly move in. We were being told- as rumored- not many of the “General Users” were going to be admitted because there were almost 1,000 Super and Platinum Pass users ahead of them (plus VIP’s and media). I was laying on the floor, gathering up energy for the Keynote while bomb sniffing dogs were circling around us. After the wait was over, we were escorted up the escalator in pairs, to the third floor. As we reached the top, the large Garage doors were open and our line broke up into a scramble for seats. Because I was the first one in, and walked ‘briskly’, I made it up to the second row behind the VIP section. This second section was already infiltrated with VIPs- but I was sitting amongst them! Throughout the Keynote, Sidney was hanging out in Moscone South maintaining the feed. 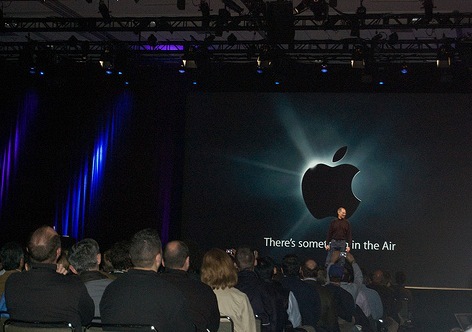 When the Keynote was over, he went downstairs and began to take pictures of the new Apple products. I hung around the keynote a little bit to watch Steve demo the MacBook Air to the Media. After about 5 minutes, I went and joined Sidney across the street. We spent a good amount of time at the Apple booth, but also explored some of the other booths in the South Hall until about 4 o’clock- when we began to feel very tired (for some strange reason). We decided for our sanity and health, we should go back and take a nap. This was, in its entirety, our Macworld experience up until Tuesday. Stick around for more stories of our journey to the world of Macs tomorrow!